We provide air ambulance services from the East Frisian islands to the mainland hospitals nationwide. Patients can be flown without any delay or loss of time from the offshore facilities to the nearest specialist hospital. Individual transport needs require the greatest flexibility. NHC is constantly on the lookout for the best solution. Northern HeliCopter – A reliable partner for offshore rescue, emergency evacuation, and flights tailored to the client’s needs. 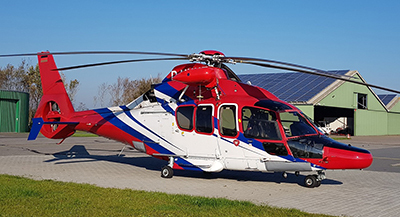 The experienced Emden airline company Northern HeliCopter GmbH carries out air rescue flights and is available for other individual flight needs. Experienced pilots and technicians as well as emergency doctors, emergency medical personnel, and paramedics make up the crew of the “Dauphin” helicopter. A friendly and client-oriented team makes sure each flight is carried out in a safe and competent way. Northern HeliCopter GmbH is part of WINDEAcare, the integrated acute and emergency care concept for offshore wind farms. The combination of experienced and established partners allows us to offer an interdisciplinary knowledge base that includes the areas of medicine, rescue services, navigation, air travel, and wind energy. This particular combination of knowledge is unique. 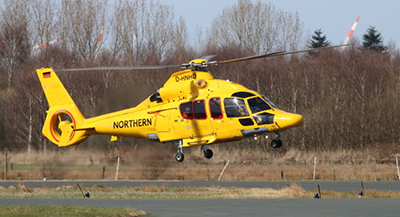 Northern HeliCopter GmbH is a founding member and a supporting pillar of WINDEAcare.